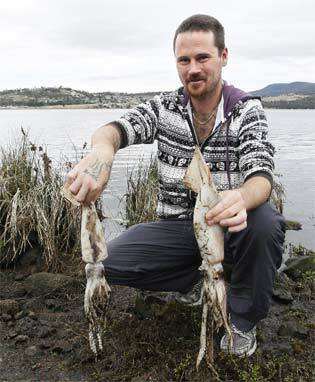 Experts have no answers on what has caused the death of thousands of squid in the River Derwent this week. Dead and dying arrowhead squid have been washed ashore or spotted floating on the water at Austins Ferry and Berriedale in Tasmania. Locals say they have never seen so many dead fish. The Environment Protection Authority yesterday confirmed reports of more dead squid further down the river. It is the third case of mass fish deaths in the Derwent in the space of two weeks. Early this week a large mass of dead juvenile barracouta was found in Windermere Bay near Claremont Primary School. This followed a similar number of juvenile barracouta being found dead just south of the Norske Skog paper mill at Boyer the week before. EPA director Alex Schaap said it was unlikely that the deaths of the squid and barracouta were related. Mr Schaap said young barracouta were particularly intolerant of low salinity, which was thought to have caused the mass deaths. But water tests have left the barracouta deaths a mystery. "We haven't found evidence of anything untoward," Mr Schaap said. Water testing is now being done to cast light on the squid deaths. "When we have an event which involves a single species we tend to suspect there is some behavioural factor involved, a natural phenomenon," Mr Schaap said. "The squid don't appear to be fully grown. Too many chemicals used to raise crops could be the prime reason of mass squid death. Rivers near agriculture are polluted all 0ver the world with chemicals washed away from farms. Big river systems wash the pesticides and all other chemicals into the seas that cause mass destruction of sea life habitat including corals and flora and fauna.